The College of Liberal Arts and Sciences is honoring 11 people with Distinguished Alumni, Faculty, and Staff Awards. Dean Christopher McCord and Provost Raymond Alden will present the awards during an Oct. 14 reception, dinner and awards program at the Altgeld Hall Auditorium. The annual awards were established during the college’s 50th anniversary year in 2009. They are given to celebrate major positive contributions to the college and its reputation for excellence. A wide range of nominations were submitted by students, alumni, staff, faculty and friends of the college. Nomination materials were evaluated by a selection committee comprised of alumni, faculty and staff appointed by Dean McCord. Top row, from left: Patricia K. Boesche, Howard T. Brady, Richard L. Escalante, Ellen E. Franklin. Middle row: Gary D. Glenn, Kelli Lyon Johnson, Gail A. Krmenec. 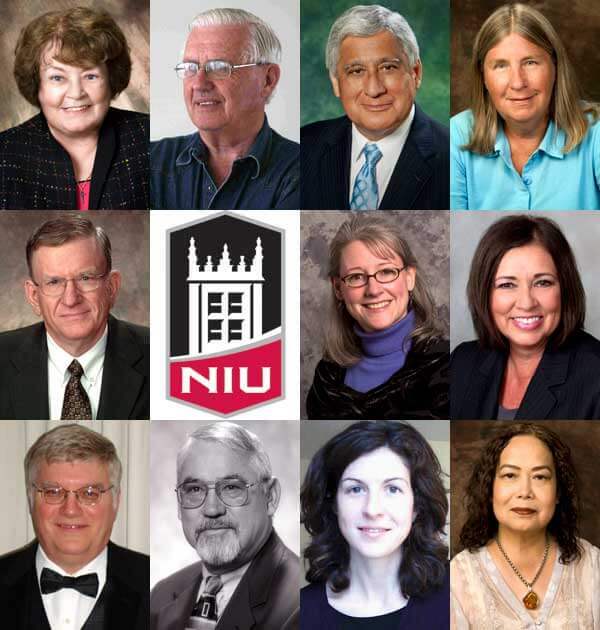 Bottom row: William E. Mickols, James D. Norris, Wendy Parker, Barbara M. Posadas. Howard T. Brady. M.S. Geology (1977). An internationally recognized scientist known for naming several types of algae, and for tracing the climate history of Antarctica. Richard L. Escalante. B.A. Political Science (1974), M.A. Political Science/Public Administration (1978). Vice-Chancellor of the University of North Texas System, and an outstanding example of public service. Kelli Lyon Johnson. M.A. Foreign Languages and Literatures (French), (1996) and Ph.D., English, (2003). Associate Dean at Miami University’s Hamilton campus and director of the Center for Civic Engagement. Gail A. Krmenec. M.S. Geography (1986). Geographer for the U.S. Department of Commerce Census Bureau, avid supporter of NIU students and an active contributor to the local and university communities. William E. Mickols. B.S. Biological Sciences and Chemistry (1977) and M.A. Biochemistry (1978). World-renowned scientist and authority in water purification and desalination and recipient of the American Chemical Society’s Heroes of Chemistry Award. Wendy Parker. B.S. Geography/Meteorology and B.A. Philosophy (1997). Associate Professor of Philosophy at Ohio University, and distinguished scholar in the philosophy of science. Gary D. Glenn. Professor Emeritus, Political Science (1966 – 2007). Recognized for his contributions in teaching, advising, scholarship and professional service; he is nationally recognized as a political philosopher. James D. Norris. Professor Emeritus, History, and Dean of the College of Liberal Arts and Sciences (1979 – 1995). A dedicated teacher and scholar who identified and inspired the faculty, in part because he was one of them. Barbara M. Posadas. Professor, History (1974 – Present). An active member of the college and university communities, and honored for her contributions to curriculum and program development, scholarship and university and professional service. Patricia K. Boesche. Business Manager, College of Liberal Arts and Sciences (1996 -2009). Recognized for her lasting contributions to the college and for careful oversight of the college’s budgets through years of fiscal constraints. Ellen E. Franklin. Assistant to the Director of First Year Composition (1992 – Present). Indispensable in developing the Communication Skills program for educationally disadvantaged students, and for her many contributions. Complete profiles are available on the Liberal Arts and Sciences website. For additional information, contact the College Communication office at CLAS-communication@niu.edu.